Visit two star attractions in one day on this private 8-hour tour from Weymouth or Portland. 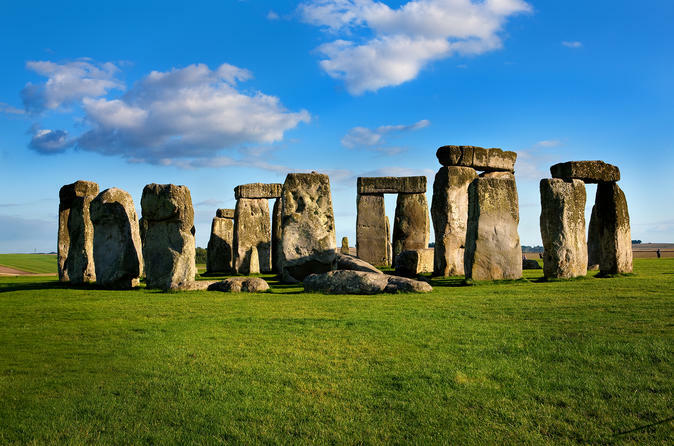 Admire the UNESCO-listed stone circle of Stonehenge and visit the Stonehenge Visitor Center, then explore historic Salisbury and marvel at Salisbury Cathedral, home of the legendary Magna Carta. Hotel or cruise port pickup and drop-off is included; entrance fees are not included. After an 8am or 9am pickup from your Weymouth hotel by private vehicle, travel north in through Cranborne Chase, into the heart of neolithic England. Enjoy a short stop to see the Knowlton Church, a magnet for those interested in the mysteries of the Earth's energy, then continue to the UNESCO World Heritage site of Stonehenge. Spend time exploring ancient Stonehenge independently or with the help of an audio guide (own expense) and visit the recently refurbished Visitor Centre to uncover the mysteries of the ancient site, which dates back more than 5,000 years. Was it a fortress, calendar, temple or a hospital? You decide. Depart Stonehenge and drive over Salisbury Plain, looking out for the region's famous crop circles along the way. In Salisbury, enjoy around 1- to 1.5-hours of free time to explore independently, stroll around the market square or enjoy lunch at one of the many cafes and restaurants (own expense). The town's star attraction is the Salisbury Cathedral (suggested donation at own expense), built in 1220, and still the tallest church in Britain. Within the cathedral you can view the world's best preserved copy of the Magna Carta, the medieval document written in 1215 that forms the foundation of the rule of law and many countries' constitutions. After leaving Salisbury, return to Weymouth, where you tour ends with drop-off at your hotel between 4pm and 5pm (depending on departure time).